"Tomorrow is Forever" 1946 Video Movie Review - 4/4 Stars Orson Welles with an Outstanding Performance! TopBilled recommended me to do a review on this movie, and boy...I am very happy that I saw it! Orson Welles delivers his lines in an Austrian accent like it is completely natural to him! One of the best post war romance films that I have ever seen! If you enjoyed my video review, please subscribe to my channel on YouTube! I come out with reviews and recommendations about 3 times a week! I also love talking with my viewers! The mirror/flashback scene. I alluded to this in my review, and I think symbolically it represents the way anxieties about war are reflected back on the characters (and viewers, too). This is the kind of visual trick that someone like Douglas Sirk would perfect in his melodramas of the 1950s. Sometimes Sirk would accomplish it with windows or other objects with reflecting surfaces. The Invisible Man comment. This is where you went in a different direction than me, and I find that fascinating. TOMORROW IS FOREVER does have elements of horror, which Welles pulls off superbly, without really veering into cheesiness or camp. Keeping secrets. Not only does Kessler (Welles' Austrian character) keep the secret of his being alive from his wife, but just as importantly, the secret of who he is and his overall identity is kept from their son. After Kessler's death, we can guess that Colbert will still consider him to have been John her first husband and you can't help but wonder if she will always keep those thoughts from the son. If so, then she becomes the keeper of the secret. The scene in the train station where Kessler acts very paternalistic without admitting he's Long's real father is very powerful. The scene where the music is absent allows Welles and Colbert to play as if it were a scene in a play. I am glad you highlighted that moment for people watching your review. 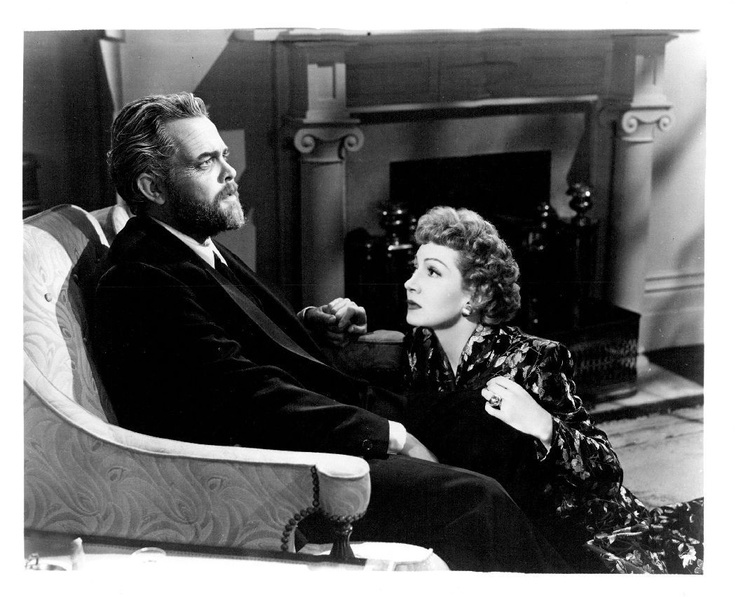 To me, it proves how fine an actress Claudette Colbert was, holding her own with Welles. Some trivia: Welles and Colbert both worked with Long again, in other films from this period. Long played Welles' young brother-in-law in 1946's THE STRANGER. And the following year in Universal's rom-com THE EGG AND I, Long had some nice scenes with Colbert. That time he did not play her son, but the son of a raucous neighbor woman (Marjorie Main). Colbert never had children of her own. Years later, when Natalie Wood died, Colbert was in advanced age and very distraught, claiming it felt like her own daughter had died. In an audio commentary for one of his movies, Robert Wagner (husband of Natalie Wood) talks about how Claudette was a mother to all of the younger stars on the set of LET'S MAKE IT LEGAL. He also said that if anyone should have had children in real life, it should have been Claudette Colbert. So I think the actress bonded well with the kids in her later movies, and it shows. It was genuine, which makes her performances seem more realistic and natural. This provides a nice complement to someone like George Brent who does not exactly emote in his films, as well as an obvious contrast to Welles in TOMORROW IS FOREVER, whose somewhat grandiose technique relies on an accent, make-up and other wardrobe gimmicks. Almost everything has been said--all I can add is score was good, & actors & theme were So much better than the story--which I thought far-fetched. I was glad he gave it four out of four stars...weren't you? There were no flaws! Plus the story was interesting and unique. I was entertained the entire film and felt a multitude of emotions...great flick! Beautiful sentimental film. I first saw it as a child on TV and then watched it several times since. Recently I acquired a great copy from a friend and watched again. I was again entranced by the beautiful music. The wonderful and sentimental storyline is a real tearjerker and every person in the film was marvelous. Especially noteworthy were some of my very favorites; Claudette Colbert, Orson Welles and George Brent. The very talented Natalie Wood was wonderful too as the German war orphan and Richard Long as "Drew". Yes, there were no flaws in this film. It is touching and appealing from the very first scene right through to the lovely and the mysterious scene with the letters and the picture. I always feel sad toward the bittersweet ending but viewing it again is a wonderful privilege. Thanks, Ian. Will love to check out your reviews on You Tube. I concur wholeheartedly about this great film. It is one of many that led to a decision from early childhood on to continue with classic films. Thank you so much MCannady1! I look forward to discussing more classics with you either here or on YouTube! of them. This is true of several I had seen on TV as a young child. They became a real window of the future and many instill ideals along the way. I have been raised by movies! LOL I think classics are perfect for raising a kid because they are very moralistic and tell good stories usually. I'm very thankful my dad got me into old movies. I'll never forget spamming Charlie Chaplin movies as a 5 year old!